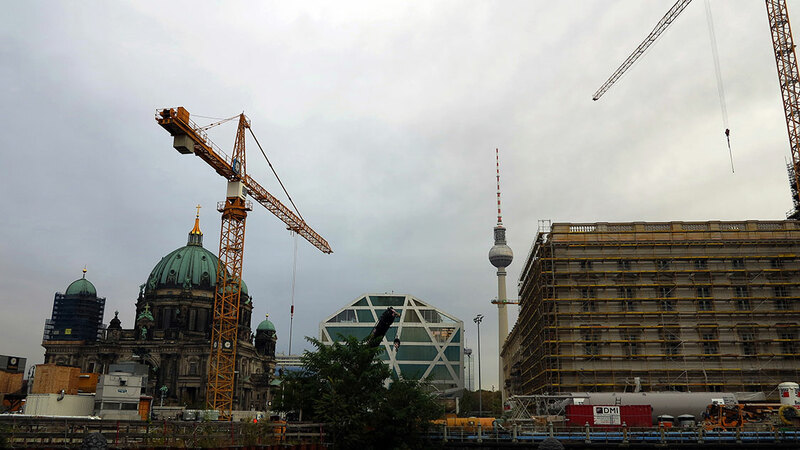 In the Fall of 2018 Ace’s work was presented to a group of museum professionals from the Pergamon Museum in Berlin along with other professionals working on initiatives focusing on conservation of the cultural heritage of Syria. These professionals are working within a contemporary global moment when museum collections, and the ways in which they have been acquired, are being problematized and addressed. Organized by Zoya Masoud, a PhD student from the Technical University in Berlin, Masoud’s research also involves working in collaboration with the Pergamon Museum’s Syrian and Middle Eastern collections. The presentation on Ace’s work was given by Leah Snyder (The L. Project) a digital designer, writer and curator who has worked ongoing with Ace on his website – www.barryacearts.com. For Snyder, the symposium offered an opportunity to position the work of contemporary Indigenous artists within the current conversation around heritage conversation. Along with the work of Jeff Thomas, Michael Belmore, Carl Beam and Robert Houle, Snyder focused predominantly on work that took place and engaged with sites in Europe. The work of each artist, as discussed, was work that looked at commemoration, monuments and the entanglement consequence of colonial histories. For Ace’s site-specific performances entitled A Reparative Act, Ace was invited by artist Robert Houle to create create these works in response to Houle’s exhibition Paris/Ojibwa, and they offered a powerful example. The exhibition took place at the Canadian Cultural Centre, Paris in 2010. 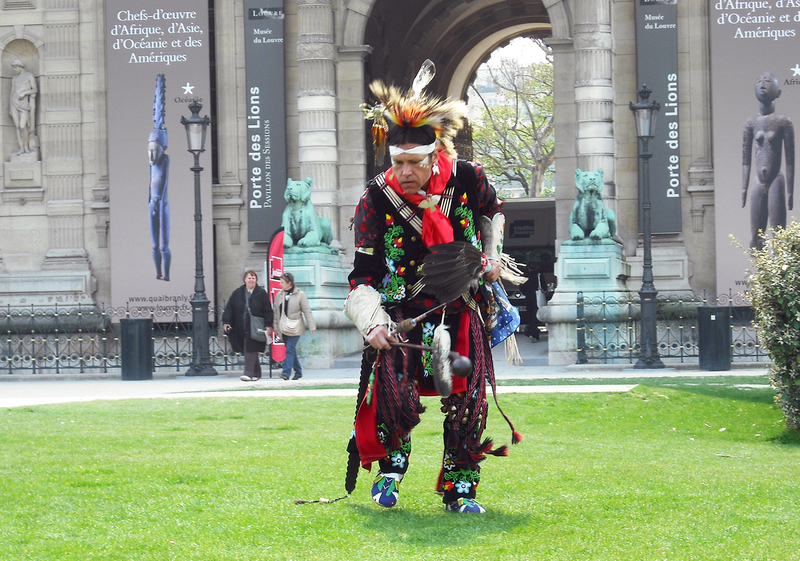 Ace’s performances at the Louvre, Jardin des Tuileries, Place de la Concorde and L’Esplanade des Invalides commemorated the lives of an Indigenous dance troupe that performed in Europe, including for European royalty, in the mid-1800s as part of George Catlin’s touring show “Indian Curiousites.” The troupe, led by Maungwudaus, also known as George Henry, was sketched by Eugène Delacroix. It was Houle’s discovery of Delacroix’s drawing, Cinq études d’indiens, during an artist residency in Paris, that led to the exhibition. Some of the members of the dance troupe succumbed to a smallpox epidemic while in Europe never to return home, the account of which was recorded by Maungwudaus in a self-published account from his journals. Through the commemoration of the lives of four men, Maungwudaus, Noodinokay, Mishshemong, and Saysaygon, Ace also touched on issues of spiritual and cultural reparation. The presentation was well received and the exchange has been generative, opening up the possibility of future Berlin / Ottawa collaborations. Further information on the presentation can be read on The L. Project News, a feed sharing the latest news of Snyder’s The L. Project clients, which include Belmore, Thomas and the Estate of Carl Beam.